I decided to review The LEGO Neighborhood book because I showed it to my son and we both thought it was a really cool book. Once the review was done I contacted Brian Lyles and asked for an interview. 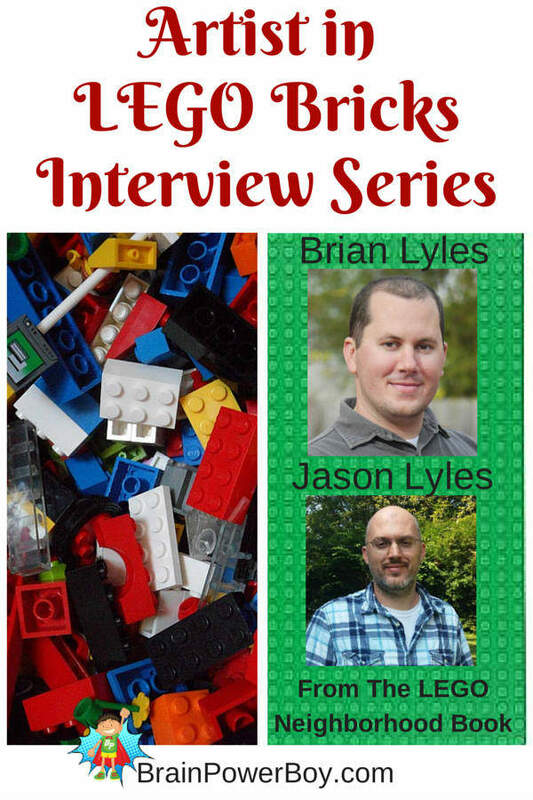 I love to interview true LEGO aficionados and see what made them tick when they were young. Brian works as a professional videographer and Jason Lyles, Brian’s brother, is a software developer. Interesting jobs! They sell plans to build LEGO models. You get a pdf with pictures of how to build the model as well as a parts list. Pretty neat stuff and a great idea for a small business. The link is at the bottom of this post. Before we get started let me share a link to The LEGO Neighborhood Book Review so you can read that as well. Brian: Obviously, I loved playing with LEGO when I was a kid. I had other toys that lots of kids my age played with, such as GI Joes or Matchbox cars, but I didn’t really have any toys other than LEGO that really challenged me to use my imagination. The one great thing about LEGO is that you can use the pieces to build your own toys. If you feel like making a spaceship, make a spaceship, and after you’re bored with the spaceship, take the pieces and make a truck, or a dinosaur. There are other toys that allow a child to build things, such as erector sets, but I’m not aware of any other toy that has the same flexibility as LEGO to make whatever you want. LEGO is also the only toy that I played with when I was a kid that I really wanted to make sure to pass down to my son. He got started with System bricks when he was 3 (under close supervision), and has advanced his skills enough that at the age of 6 he was able to build 10243-1 Parisian Restaurant mostly by himself. Brian: There is definitely more than one way to go for older kids to still enjoy LEGO. Older kids might enjoy building more complex or larger models. By posting their work to Flickr or MocPages, they can receive encouragement from the community to explore their ideas more. An obvious way that older kids can continue to work with Lego is by getting into the Technic or Mindstorms lines. These more advanced sets teach the basics of pneumatics, mechanics, electrics and programming. Kids can actually do some pretty fascinating stuff with the Mindstorms robotics. Another, non-technical way for older kids to enjoy LEGO is to view the bricks as an art medium. Anything your child builds is an expression of who they are and what they find interesting, so in that sense, your child is already making art. Some people though have become very skilled with LEGO and their work, I think, raises LEGO to an art form. Brian: You’re never too old. 🙂 Also, it seems that playing with LEGO when you’re young helps to build strong analytical skills. I’m a software engineer by trade and one time during lunch break, the conversation turned to LEGO. As it turned out, all the best engineers in the room played with LEGO when they were kids. Coincidence? Brian: 1. Build 2. Take apart 3. Repeat. It’s like anything else, the more you do it, the better you’ll get. Don’t be afraid to make something that looks terrible, just try again. All is not lost if a model you make doesn’t turn out well, along the way you might have learned a new technique. Take a moment to watch this video. 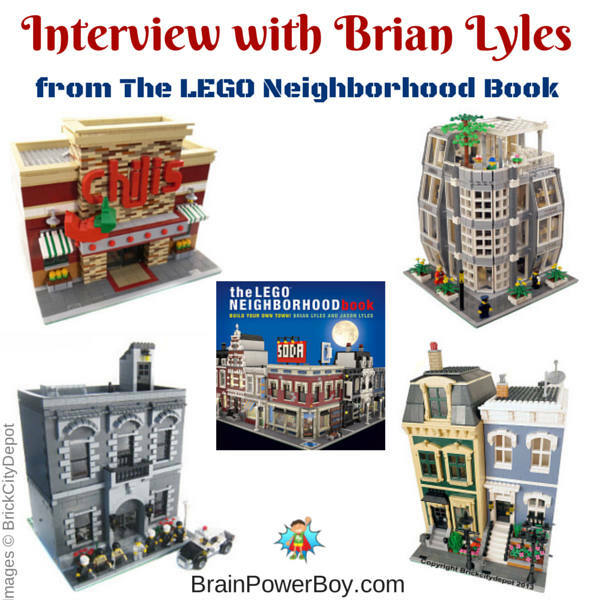 It showcases the book and will give you a great idea of the type of builds Brian Lyles and Jason Lyles are famous for. Special thanks goes out to Brian for agreeing to our interview. It is always interesting to see what these awesome builders have to say about LEGO and learning. You can follow Brick City Depot on Facebook (be sure to give them a like while you are there,) on Twitter and go check out their YouTube channel for more videos. They also run Brick City Depot. If you are not familiar with it click over and have a look. If your boy has a favorite builder that he would like to see an interview with, please leave a comment below.